On March 9th the London-based Arabic newspaper Al-Hayyat reported that Hizballah’s South Lebanese TV station Al-Manar has decided to start broadcasting via satellite transmission. Muhammad Ra`d, a Shi`ite member of the Lebanese Parliament and the largest shareholder in Al-Manar made the announcement following a meeting with the Lebanese Minister of Transmission. Al-Manar TV currently dedicates most of its broadcasting to Hizballah military operations against Israeli soldiers in South Lebanon, broadcasting from the field and displaying photos of dead Israeli soldiers. The station also broadcasts the declarations and speeches of Hizballah leaders, primarily secretary-general Sheikh Hasan Nasrallah. Naif Krayyim, the executive director of Al-Manar said negotiations were in progress with several satellite stations, including the Saudi “Arabsat,” the Egyptian “Nilesat” and “Eutel Sat,” which broadcasts to Europe. He mentioned that there was a dispute over the religious content of the TV station, which is regarded as quite extreme, but tended to downplay this point as an obstacle. He promised that Al-Manar “will not broadcast material that might raise delicate issues in the Arab World.” He made it clear that the aim of the satellite transmission is “to present a different picture of the Islamic resistance in Lebanon and its relationship with the Lebanese authorities.” He added that Al-Manar was seeking the commercial and advertising market of the Gulf States following a successful tour to the UAE and Qatar, where he held talks with potential advertisers. It should be noted that following the coverage of its operations in South Lebanon Al-Manar became an important source for foreign news agencies and TV stations where Hizballah activity is concerned. The movement’s leaders have often stressed the importance of the station for influencing Israeli public opinion, as well as the place of propaganda as an offensive weapon. Hizballah is in fact extremely efficient in its use of propaganda, both in its struggle against Israel and its internal goals on the Lebanese scene. This is true not only with regard to its TV station but its websites as well. This propaganda has a only a minimal affect on Israeli society and public opinion, which is divided in the case of the Israeli presence in Southern Lebanon. However, Al-Manar’s transmissions are frequently cited by the Israeli Media, which often rebroadcasts photos from various Hizballah operations, and this most likely does have some effect in Israel. If Hizballah is permitted to broadcast by satellite, it will be the first guerilla/terrorist movement to have such propaganda facilities. The significance of this lies not only in the precedence set for other organizations, but in the excellent opportunity thus given to the Iranian revolutionary Islamic ideologues to distribute their ideas to the Sunni Arab world, primarily Saudi Arabia and the Gulf States. Even if in the face of the decline of the influence of extremist religious trends in Iran itself, the regime could still continue to distribute its ideas through Hizballah, whose religious leadership has is as orthodox today as it was in the days of Khomeini. This should also be a point of concern for the Syrian government. For if Israel goes ahead with the withdrawal from Lebanon in July 2000, the result will be among other things the refocusing of Hizballah’s attentions on the Lebanese internal scene, a situation which will provide an outlet for the organization’s considerable propaganda talents. The possibility of Hizballah’s use of satellite broadcast should also focus the attention of counter-terrorism experts on the connection between terrorism and the media on one hand, and cyber-terrorism via propaganda, on the other. 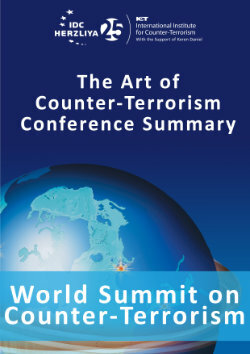 Above all, the issue highlights yet another area in which international counter-terrorist cooperation is long overdue.